I have been away form the blog for few months now. The move to Qatar has meant adjusting to life in the desert and learning a lot new relevant aspects of my new job. There are so many things to learn and too many things to do. Sadly the time to update the blog has been less than expected. Abandoning Windos for Mac has also not helped, as I am still trying to find a good software solution to be able to blog more often (if you have suggestions, feel free to email them!). Anyway, I want to share the news that finally this paper has been published. This was the result of a lot of hard work from Dr. Andy Galbraith and a collaboration with Professor Louis Passfield’s group at University of Kent to make sure we made the most out of the data gathered in the study. Hopefully more data of this study will be published in the future. Affiliations: 1Endurance Research Group, School of Sport and Exercise Sciences, University of Kent, Chatham Maritime, United Kingdom. 2Aspire Academy, Doha, Qatar. 3 Department of Computer Science, University College London, London, United Kingdom. 4 School of Medical Sciences, University of Aberdeen, Aberdeen, Scotland. Purpose: This longitudinal study examined the training and concomitant changes in laboratory and field-test performance of highly trained endurance runners. Methods: Fourteen highly trained male endurance runners (mean ± SD: VO2max 69.8 ± 6.3mL·kg-1·min-1) completed this 1-year training study commencing in April. During the study the runners undertook 5 laboratory tests of VO2max, lactate threshold (LT) and running economy, and 9 field tests to determine critical speed (CS) and the modelled maximum distance performed above CS (D’). The data for different periods of the year were compared using repeated measures ANOVA. The influence of training on laboratory and field test changes was analysed by multiple regression.Results: Total training distance varied during the year, and was lower in May-July (333km [SD: ± 206km], P=0.01) and July-August (339km [SD: ± 206km], P=0.02) than in the subsequent January-February period (474km [SD: ± 188km]). VO2max increased from the April baseline (4.7L·min-1 [SD: ± 0.4L·min-1]) in October and January periods (5.0L·min-1 [SD: ± 0.4L·min-1], P<0.01). Other laboratory measures did not change. Runners’ CS was lowest in August (4.90m·s-1 [SD: ± 0.32m·s-1]) and highest in February (4.99m·s-1 [SD: ± 0.30m·s-1], P=0.02). Total training distance and the percentage of training time spent above LT velocity explained 33% of the variation in CS. Conclusion: Highly trained endurance runners achieve small but significant changes in VO2max and CS in a year. Increases in training distance and time above LT velocity were related to increases in CS. The Internet is a wonderful place, where everyone can freely communicate and write and discuss pretty much about everything. Freedom is a great thing, sadly it also poses its risks. In fact pretty much everyone can put up a website and become a self proclaimed expert in everything as well as writing about sensational theories and claim they have invented something. Last but not least, a website can also be a place where you can pretty much claim you know it all and everyone one else is wrong as well as claim magic effects of applications of your theories. I came across few of these, where self-proclaimed experts with no qualifications try to sell everything, from miraculous training methods, to super-foods and supplement to amazing exercise machines as well as selling their own pseudo-expertise. This is all possible simply because everyone can write whatever they want on a website or blog without undergoing the peer review process which is the basis of a scientific publication. I can use this blog in fact to write whatever I want and I totally control the content. However my aim is to write and discuss scientific matters related to sport providing my views on particular issues and/or reporting some interesting (to me) findings published in the scientific literature. I don’t propose wacky theories, I don’t claim to be the only person on the planet with all the right answers and I don’t plan to build some cargo cult science following unlike so many individuals on the internet. Some people in fact have websites where they criticize everything and everyone, they claim to have the right theories and they claim to have made inventions as well as stating that scientists (the ones that publish on scientific peer reviewed journals!) don’t get it, are wrong and don’t understand what they are talking about. But such people have never published anything anywhere, have never patented an invention and most of the times do not even have a basic degree in the field. 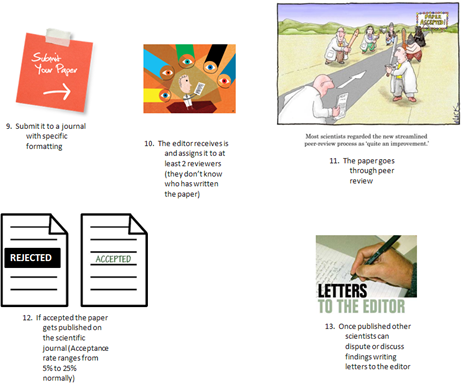 In this post I want to explain what is a scientific publication, what is the process needed to get a paper published and how a scientific paper looks like. Scientific literature comprises scientific publications that report original empirical and theoretical work in the natural and social sciences. Scientific research on original work initially published in scientific journals is called primary literature. Patents and technical reports, for minor research results and engineering and design work (including computer software) can also be considered primary literature. Secondary sources include articles in review journals (which provide a synthesis of research articles on a topic to highlight advances and new lines of research), and books for large projects, broad arguments, or compilations of articles. Tertiary sources might include encyclopedias and similar works intended for broad public consumption. A blog or a website is not considered (quite rightly) scientific literature or a scientific publication. None of the articles I write on this blog can be considered scientific literature. What is the process to get a paper published on a scientific journal and how long does it take? 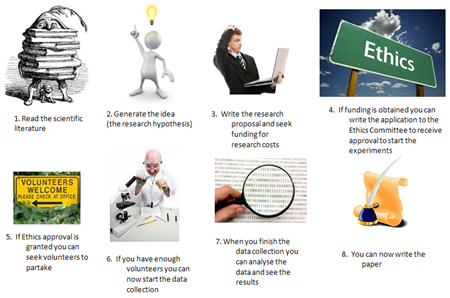 The process is quite long and sometimes it can take years from the idea to the publication on a scientific journal. The basic criterion is that there is a formalized process of peer-review prior to publication – so this presents a barrier to publication that acts as a quality control filter. Typically, the journal editor will give a submitted paper to a small number of qualified peers – recognized experts in the relevant field. The reviewers will then submit detailed criticism of the paper along with a recommendation to reject, accept with major revisions, accept with minor revisions, or accept as is. It is rare to get an acceptance as is on the first round. The editor also reviews the paper, and may break a tie among the reviewers or add their own comments. The process, although at times painful, is quite useful in not only checking the quality of submitted work, but improving the quality. A reviewer, for example, may point out prior research the authors did not comment on, or may point our errors in the paper which can be fixed. This is not a perfect process but at least creates some filter to information. I am and have been a reviewer to hundreds of manuscripts submitted for publication to various journals and always strived to provide a fair and constructive review as well as rejecting work which was not of the right quality. The value of a scientific publication goes beyond the simple benefit of being filtered by peer review. It’s also a way to communicate your ideas to your scientific peers, and invite them to express an informed view as well as using your findings to advance knowledge in the field. Peer review is not always perfect. Peer review is often represented as some kind of policing system for truth, but in reality, some dreadful nonsense gets published, and mercifully so: dubious and low quality material can sometimes get published; then the academic readers of this literature, who are trained to critically appraise a scientific case, can make their own judgement. This is the real stage of review in my view. After publication other scientists will decide. If there are flaws in your case, responses can be written, as letters, or even whole new papers. If there is merit in your work, then new ideas and research will be triggered and your work gets cited. That is the real process of science. The first part is normally an abstract; this is a short summary of the work, and is intended to serve as a guide for determining if the articles is pertinent, and to furnish subject metadata for indexing services. Abstracts should be read only when trying to find pertinent articles. The real information is NEVER in the abstract. If you only read abstracts you have not read the paper, you don’t know anything about the details of the experiment. The content is presented in the context of previous scientific investigations, by citation of relevant documents in the existing literature, in a section called an “Introduction“. Empirical techniques, laid out in a section usually called “Materials and Methods“, are described in such a way that a subsequent scientist, with appropriate knowledge of and experience in the relevant field, should be able to repeat the observations and know whether he or she has obtained the same result. The methods section allows the reader to understand what happened as well as read the research design and the statistical techniques used. The results of the investigation, in a section usually called “Results”, are presented in tabular or graphic form (image, chart, schematic, diagram or drawing) as well as text. Interpretation of the meaning of the results is usually addressed in a “Discussion” and/or “Conclusion” section. The conclusions drawn should be based on previous literature and/or new empirical results, in such a way that any reader with knowledge of the field can follow the argument and confirm that the conclusions are sound. Conclusions must not depend on personal authority, rhetorical skill, or faith but should be based on the results. Finally, a “References” or “Literature Cited” section lists the primary sources cited by the authors in the format required by the journal. When reading information on the internet try to understand where it is coming from. When you want to know and understand more, always go to the primary sources. Don’t read only the abstract, try to get the full paper and read and study each section to understand the details. Make your mind up and read again, sometimes you might miss important points or relevant papers cited.